"You don't know what you've got..." - Until you count it! The value of the Grey Infrastructure (roads, bridges, highways) in our urban spaces gets a lot of press. The Green Infrastructure has been completely undervalued and is typically unseen. There is tons of data about the state (and current value) of roads and and other parts of the publicly-owned grid that keeps us moving - but - until now, we've had no data about the assets that 'keep us breathing' as we go about our busy lives. This groundbreaking report lays it all out, and puts a real value to our Green Infrastructure. The numbers reveal that (today) the Urban Forest Canopy covers 26% of the GTA. 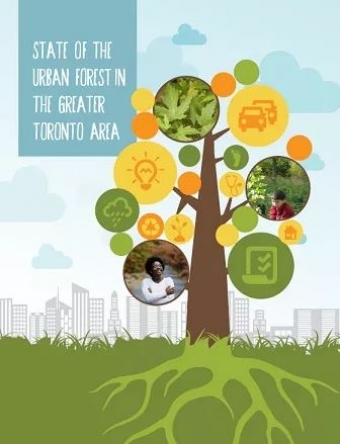 The GTA's Forest Canopy is made up of the trees and shrubs that constitute the Green Infrastructure of Toronto and its surrounding municipalities (the 3rd largest city in North America). The report inventory was directly conducted by the 17 municipalities in the area, and included a great deal of detail - including a species list, and the size (age) of the trees that make up today's forest canopy. So we need to plant more trees - Now! And newly planted trees need to be as diverse as possible to avoid the problems like we're seeing with the Emerald Ash Borer. So what's the GTA's Green Infrastructure Worth? About $130 Million Dollars Annually! Now that we know what we've got, a value has been established for our urban forest canopy as well. Unlike the Grey Infrastructure, which is constantly aging and losing it's value, the Green Infrastructure of living trees and shrubs appreciates in value as it grows. One of the major issues with the present tree canopy is that it is aging rapidly - the new numbers bear out that many newly planted trees aren't living to a ripe old age like they used to. There is a huge and growing gap between the oldest trees, and those recently planted. Newly planted trees die-off before they reach anything like a mature size. Part of the problem here is acknowledged to be the deteriorating quality of the soil environment in which new trees are planted. Both soil volume, and soil quality, are turning tree plantings into 'tree coffins'. Newly planted trees need help! Minister Murray also took the time to visit our website - and - included a pitch for our technology in his keynote address - and he also gave us a nod on Twitter. Let's give new trees a fighting chance by giving them a host of living beneficial fungi when we plant them - the payback is no longer a matter of debate.